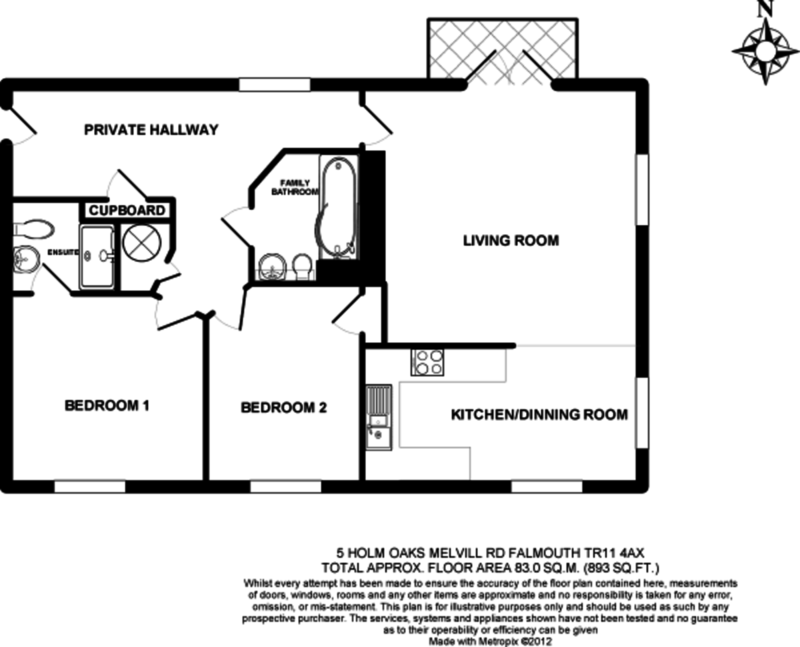 A fantastic apartment superbly located in a sought after area of Falmouth. Purpose built modern development of just ten apartments with allocated parking and lovely communal gardens. This generous two bedroom apartment benefits from level access, balcony and master en-suite. No onward chain. THE LOCATION Located within a short walk of Falmouth's seafront, harbourside and town, Melvill Road is a highly popular and established residential area of Falmouth, with commercial, leisure and retail amenities close at hand. Falmouth is renowned for its beautiful period buildings and wonderful sailing waters; a true sailors town Falmouth has seen a renaissance over the past ten years and offers a vast array of bars, restaurants and pubs to suit all tastes. Famed for its many festivals and regattas, the town also offers a good selection of shops, from boutiques to high street retailers. The beauty with this location is though that one is only a short walk away from the beaches of Falmouth also - Cliff Road being one of Cornwall's most beautiful promenades and connecting Pendennis Castle to Gyllyngvase beach. From here you can enjoy safe swimming waters and sandy beaches whilst a footpath links you to Swanpool beach and beyond. THE PROPERTY Positioned on the ground floor of this highly-regarded development, built in 2006 by respected builders, St Mary's Homes, this well-proportioned apartment enjoys completely level access from the parking area. The apartment is luxuriously appointed throughout, with two double bedrooms (master en-suite), separate family bathroom, dual aspect living room with a balcony and far-reaching view to the harbour, and a fully integral kitchen/dining area. All is well equipped with gas central heating, double glazing and plenty of storage - a rarity for most apartments! Outside there is allocated parking for one vehicle as well as the use of two visitor spots and the well kept communal gardens provide a lovely space to sit out and enjoy. Available with no onward chain and highly recommended. Pleasant curved raised walkway leading to glazed door and in to communal entrance hall. Nice wide light space with stairs to other apartments also served by lift. Number 5 has level access through a further door into hallway for three flats. LIVING ROOM 14' 7" x 13' 8" (4.47m x 4.19m) Lovely large square room with light flooding in from window to side aspect and double opening patio doors to the balcony. Carpet, radiator, lighting, plenty of power points, phone line and tv points. BALCONY 7' 0" x 3' 7" (2.14m x 1.10m) Double doors open out onto private and paved balcony enclosed by railing. Space for two chairs and enjoying glimpses over rooftops of Falmouth harbour and over to Flushing. KITCHEN/DINER 16' 7" x 8' 10" (5.07m x 2.71m) Through open entrance from living room into another light room with dual aspect windows to front and side. Laminate flooring, radiator, lighting. Plenty of space for dining and fully fitted kitchen comprising; range of base and eye level units, worktop, one and a half basin and drainer, double oven, four ring hob, extractor over, integrated dishwasher, washing machine and tall fridge/freezer, eye level fitted microwave and wall mounted gas boiler. EN SUITE 7' 8" x 8' 10" (2.36m x 2.71m) En-suite shower room with tiling floor to waist height, heated towel rail, lighting, extractor, wall mounted light with shaver point, pedestal wash basin, low level flush WC, double width shower with glazed sliding door. BEDROOM TWO 12' 0" x 9' 3" (3.67m x 2.82m) A second double bedroom with window to front aspect, carpet, radiator, lighting and wardrobe built in to recess. BATHROOM 8' 7" x 6' 7" (2.63m x 2.01m) Great sized bathroom; tiling floor to waist height and around bath, heated towel rail, lighting, extractor, wall mounted light with shaver point, fitted basin with storage beneath, low level flush WC, P shaped bath with shower over and glazed screen. COMMUNAL GARDENS Very well established and presented communal garden areas to the East and South sides of the building linked by a path wrapping around the building. PARKING Allocated parking space for number 5 and the use of two visitor spaces.